As the 2016 Titans Cup gets underway, Liquid Expat Mortgages is proud to be one of the sponsors of IPG’s prestigious golfing event. Tomorrow marks the start of the most high-profile golfing event in the Middle East, the Titans Cup 2016. Hosted by leading property investment firm, IP Global, the first leg of the competition will be held at The Els Club, Dubai, on 2nd March, followed by a second clash at Emirates Golf Club in October. The Titans Cup brings two of the UAE’s biggest golf brands – Dubai Golf and Troon Golf – head to head for this annual 18-hole golf event. 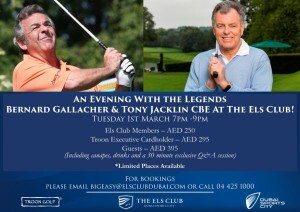 Both will be headed up by former Ryder Cup Captains, with Bernard Gallacher leading Dubai Golf and Tony Jacklin heading up Troon Golf. Sponsoring one of the holes, Liquid Expat Mortgages will be following the action with eager anticipation, as the Middle East golfing community awaits the outcome of the first leg with baited breath. We have also donated several prizes to be given out on the day. It may be a friendly tournament, but with the support of prolific Ryder Cup champions, IP Global Platinum Club Middle East partners, the Emirates Golf Federation and UAE Professional Golfers Association, it’s set to be a spectacular show of talent. With 50 players on each team, comprising current and former professional golfers, as well as high profile VIPs from the events sponsors and partners, the Titans Cup 2016 has already received extensive coverage from the regional and international media. For a taste of what to expect on the day, and to get a snapshot of The Els Club championship golf course, watch the event preview. Want to follow the action tomorrow? Head over to Facebook or Twitter for the latest developments as they happen.